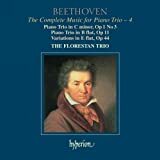 The Florestan trio offer a less dramatic view than some rival groups such as those featuring Ashkenazy and Perlman for example, with the emphasis on light and shade, fleetness and quicksilver detailing. There is no shortage of sheer verve but this is kept correctly within a classical period framework. 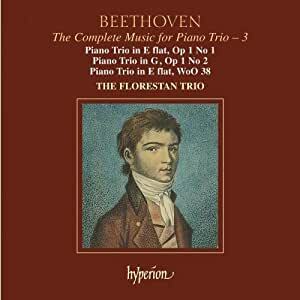 The humour of these early trios is also brought out very strongly and the overall effect is one of complete enjoyment of the process of music making. This feeling of corporate and individual artistic pleasure communicates strongly to the listener and is a marked advantage when choosing a recorded set of performances. The recorded ambiance provided by Hyperion is more akin to a more intimate setting and obviously more 'chamber' in feel and suits the style of performance precisely. This disc therefore certainly deserves to be considered seriously by anyone interested by the program. It is also worth mentioning the the whole set of the trios is now available as a boxed set and which may be even more attractive. They are all of equal merit.